More than 28,600 people have signed. 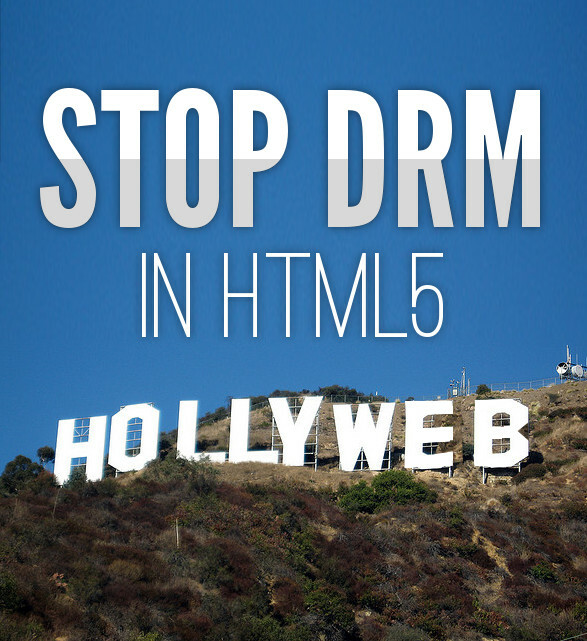 On May 3rd, 2013, the International Day Against DRM, we drove the message home by delivering your signatures to the W3C along with an Oscar award for "Best Supporting Role in the Hollyweb" (pictures here). Moving forward, we need your signature as much as ever. We're hoping to have a deepening conversation with the W3C and the more concerned Web users supporting our position, the better. Sign below! Need more information first? Read this article by our friends at the Electronic Frontier Foundation. We call on the World Wide Web Consortium (W3C) and its member organizations to reject the Encrypted Media Extensions proposal (EME), which would incorporate support for Digital Restrictions Management (DRM) into HTML. EME would be an irreversible step backward for freedom on the Web. It would endorse and enable business models that unethically restrict users, and it would make subjugation to particular media companies a precondition for full Web citizenship. Just as Flash and Silverlight are finally dying off, we should not replace them with the media giants' latest control fantasy. Furthermore, EME contradicts the W3C's core values. It would hamper interoperability by encouraging the proliferation of DRM plugins. It would fly in the face of the W3C's principle of keeping the Web royalty-free — this is simply a back door for media companies to require proprietary player software. It is willful ignorance to pretend otherwise just because the proposal does not mention particular technologies or DRM schemes by name. W3C and member organizations: don't weave DRM into the fabric of the Web. In addition to creating this petition, Defective by Design has joined 26 other organizations in a coalition to oppose Encrypted Media Extensions. See our joint letter to the W3C condemning the proposal. "The W3C has a duty to send the DRM-peddlers packing, just as the US courts did in the case of digital TV. There is no market for DRM, no public purpose served by granting a veto to unaccountable, shortsighted media giants who dream of a world where your mouse rings a cash-register with every click and disruption is something that happens to other people, not them." "W3C is there to create comprehensible, publicly-implementable standards that will guarantee interoperability, not to facilitate an explosion of new mutually-incompatible software and of sites and services that can only be accessed by particular devices or applications. But EME is a proposal to bring exactly that dysfunctional dynamic into HTML5, even risking a return to the "bad old days, before the Web" of deliberately limited interoperability." Please share the Hollyweb image, which is copyright Free Software Foundation 2013, under the Creative Commons Attribution-ShareAlike 3.0 Unported license.